Lock Up Your Daughters! It’s A New New Band Clear-Out! Some days, one new band will suffice. This is not one of those days. Occasionally the pile of new bands marked ‘to do’ in ANBAD Towers becomes so vast and unwieldy, that drastic action has to take place. Today is one of those days. So here’s the slight return of the Great ANBAD Band Clear Out. Everything must go! Second! Humanizer – look beyond the clunky name and just feel those epic chord changes, the swirling sonic miasma and the vague feeling that Humanizer might be the Manchester band that breaks out before all the others. Third! Mondegreen – Glasgow spews forth yet another sharp, cracked, jang-ular new band. Say It Don’t Spray It leaps here, there and straight up your trouser leg. Excellent, bizarre, freshhhhhhh. Fourth! Yeti Lane – I’m fairly sure Yeti Lane are French. If so: they are another lovely example of French guitar-pop’s slithering, lithe, lubriciousness. If they’re not, then they’re an excellent, spooky, inventive band. Either outcome is very good. Fifth! Bodies Of Work – Flyers is radio-friendly Indie that’s also ear-friendly. This in itself is a rarity. Tender and tough, prickly and smooth. Charming. Enough! Five is, indeed, enough for now. 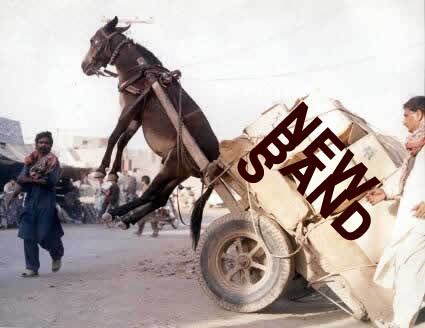 Rest assured th0ugh, that the VAST pile of TEETERING new bands is simply THREATENING to overwhelm us all at any moment, and such multi-band excess will appear here very soon! Posted on March 24, 2010 by Joe Sparrow. This entry was posted in Headline, Today's New Band and tagged Band Clear Out. Bookmark the permalink. I think it’s almost guaranteed that that photo illustrates the high point of that donkey’s existence. Another New Band Clear-Out; Endorsement From Lydia Lunch To Follow | A New Band A Day!